A recording studio. A stage. A newspaper. A mini-bar. Can Altay is an artist and designer blurring the edges of everyday and artistry to create platforms that fathom the fantastic among the familiar. His interest lies in how we inhabit urban spaces and systems, creating not just social interventions, but community contributions that reconfigure a place’s meaning and its use. This focus on collective identities has moved his practice towards spaces that make music and sound: a mode of expression ‘that has to be shared and to be experienced together with people.’ He explores how these sonic platforms give rise to unforeseen forms of community, and can shift the narrative of a place, drawing him to artist residencies in Bristol's Spike Island, in Loughborough, and now an open recording studio at the famed İMÇ buildings in Istanbul. Can transports us to this modernist musical mecca at İMÇ, ‘a place engraved in our collective consciousness in Turkey,' to talk about how sound influences his work. Can, your work crosses many disciplinary boundaries. Tell us about your background and how it influences the way that you look at places. I studied interior architecture and environmental design. And while it was a course more geared towards commercial practice, I had access to contemporary art, urban studies, philosophy and other sources of thinking. So, I made a mix of my own. In retrospect, I think that gives me the basis for dealing with existing spaces. Not thinking about building everything from scratch, or constructing something anew. You could call it a negotiation or a dialogue within an existing environment. Afterwards, I did a program called critical studies and that was at the Malmö Art Academy in Sweden. I was already practicing as an artist, producing work mostly in relation to urban spaces. Back then I was looking into the ways in which people make space rather than designing spaces. 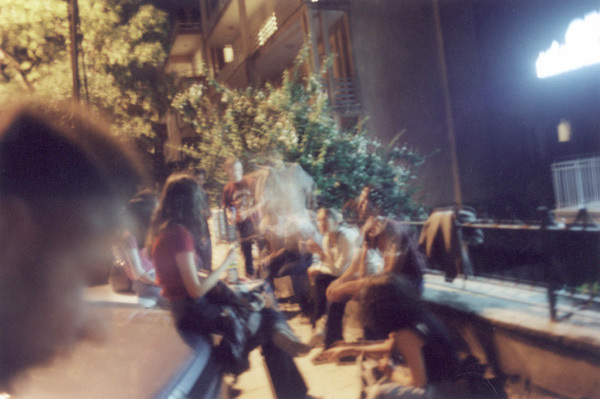 There were two major starting points for me: one was the minibars in Ankara, which was a kind of impromptu gathering of young people in in-between spaces, generating their own nightlife where the service factor was eliminated. It was just hanging out, but significantly making space through that, without building anything. The second was the informal garbage collection networks, “the papermen” — again in major cities in Turkey. Both had to do with my everyday life, but in distinct ways. And how they related to the city was important to me, almost like parallel universes. That's a good way to put it. When you're looking for places in everyday life, these parallel universes, is there a specific conflict or theme that you look for? In looking back, what I see as the beginnings of my practice, I was looking into moments and situations where people's activity surpass, or even overcome, the design intentions or what the designers or the planners or architects can envision. Ways in which use becomes creative or use becomes a kind of generative factor. That was what I thought could be learned from. And in return, this directed me towards thinking about whether or not it's possible to make more open-ended work as well, things, spaces or places that invite people to contribute and generate further meaning beyond what I envisioned, or beyond what I anticipated already. Recently I've tackled this term, “social choreography”. It's a relationship with the users — or inhabitants may be a better word — that sets out certain notions and regulations, but also leaves room for a collective production. How do you start researching the places or cities you've been working in? With the Minibar and the Papermen (garbage) project, it was for me important that I claim no objectivity. I always intermingled work with my own daily life, because those were the places I was living and those were the people I was encountering. One key moment, was that this research was appreciated by the art context. I made them for that context as well. But I noticed that exhibitions are also spaces that build a narrative that have certain presuppositions, which also comes with its own limitations. So, from mid 2000s until maybe 2010, and still to a certain extent I have been heavily involved in thinking about the art institution, the art context, and the exhibition as a kind of public space and finding ways in which I could intervene in exhibition making. I started proposing these platforms or small environments or spatial interventions that I call settings, and these would be the places that were immediately evident that gave a context — the places where people could gather, exchange or produce some sort of knowledge or outcome. So, basically places that also have a presence. So give us an example. In Bristol, there's a place called Spike Island where I was invited to have a residence. And before I was going I had this image of Bristol — in my cosmology! — which was related to music and had in mind that I would do something around that. During the residency, I also came across people who work with sound or music in different ways. And as part of my exhibition we built a simple wooden platform, fitted with a lot of free-cycled Hi-Fi speakers. Basically, it's a marker, an architectural object or kind of a podium that you can use as a stage. It's also the place where the audience can come together. It's also the sound system itself, because it's all fitted with speakers and people can literally plug in their instruments and play. So it becomes a kind of instrument as well. I invited musicians and sound artists to do things with this platform. This is what I mean by ‘setting a setting’. I create something slightly dysfunctional — it's not the best PA, it's not the best technology — but it allows something else to happen. So, one by one, people started coming and doing performances and then the musicians and sound artists were exploring the limits of what I proposed them and also coming up with things I couldn't have imagined at all, like ways in which that platform can be inhabited. During opening hours, it was also up to anyone who wanted to plug-in and play, creating a soundtrack for the institution, or use it in whichever way they wanted. How do you curate these kind of interactions? Do you define certain collaborations or is it all welcome to whoever's interested? I've been doing it as open as I can. There are degrees of collaboration, primarily and most importantly with people whom I work with in making and running such settings. That is followed by calls, words of mouth, and reaching out to people who’d be interested. And then there’s always the beautiful random encounters. In the case of Spike Island, during the course of my residency I spent three months there before the exhibition. I tried to meet as many people as I could: it was this growing family of collaborations. 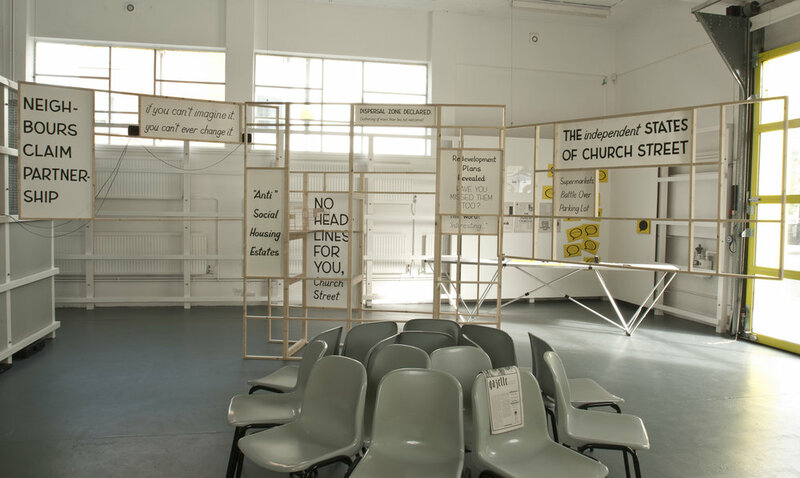 Spike Island particularly, and Bristol as well, had that sense of a community that was accommodating and open — and it was also an occasion for them to be able to take part in such a platform. You've used sound and music a number of times in your work. Why do you think it's such a powerful way of talking about a place or a culture? Why does it seem to resonate with people? I think it's strong and obvious in the most basic way. Music has to be collective. It has to be shared and it has to be either made together with people, or experienced together with people. You have to do it together. And then the vibe — I'll say vibe, for lack of better word — is also something collective that taps into that sense of togetherness. That's a brilliant point. And it’s something that many people are drawn to. Exactly. Especially since I started venturing outside the art audience, and doing projects such as “PARK: bir ihtimal” where the encounter is embedded in using the setting. Another thing with these ‘settings’ — especially with settings in particular neighborhoods — I also started believing in familiar formats. That helps you get over many kinds of questions or doubts. It's as simple as like, "Okay, we are using this space and facilities to make a local newspaper that deals with the issues of urban transformation happening in this neighborhood." So, the format is an easy way for people to understand, to tell a story. The medium is a newspaper that everyone knows. That way the content is more surprising when it’s unfamiliar. The interface is something that breaks down the barriers. Exactly. This familiar format bypasses the challenges that otherwise could happen. Of course, you can also try out new formats. But for me, it's helpful to reconcile or come to terms with like, "We are doing a newspaper," or, "We are a recording studio, come and record whatever you want to record. It's open for sound, for your music, for what you want to say." And then through that project, whoever wants to contribute also becomes a community that's woven around the project. Which is the main motivation for me. It's not only the space of course, but also what is generated in the space. So, in the case of the newspaper, you have a publication as a legacy. And in the case of the recording studios, like the one we did in Loughborough and now in Istanbul, you have all the songs and all the sounds that's been recorded at this given moment. And the setting or the environment that I create is a trigger, the instigator and also the facilitator for this to happen. How do you decide the format? Is that something which comes out of the narrative of the place? Yes, or the lack of. For The Showroom, we made a project called the Church Street Partners' Gazette. The Showroom is a non-profit art gallery in West London that had just moved there and were trying to find their footing. Emily Pethick had just become the director and starting what is now a superstrong programme and identity for this small institution. They were aware that they are right in the center of an area which is relatively disadvantaged compared to its surrounding neighborhoods, since Church Street is surrounded by prime real estate. So how did you find the narrative in this case? You asked me about the method, or how do I research? I do a lot of scouting or drifting to figure out a sense of place. I speak to people, but I prefer not to tap into existing community structures right away because they can become limiting or they can give you a very clear perspective of their own, but there may be other frames. So, I try to be open about that and just start from very preliminary observations. Sometimes, like in PARK: bir ihtimal we have time to do more intensive investigations in advance. And sometimes the project itself becomes the investigation like the Church Street Partners’ Gazette. In the Church Street area, those preliminary observations and first encounters with actors in the area were important. Because there were also unclear plans of redevelopment, and I sensed that people were hesitant, or concerned. Also, The Showroom being an art space, you can imagine, it can be a sign of change as well. So, I felt like, "Wow, there's a need for a communicative platform.” A kind of place for exchange of ideas and news. Not daily news, but information about the neighbourhood, that could double as a platform for reflection. Immediately I thought, "This is the thing to do." So we used the time and space of an exhibition to generate this local newspaper. It's called Manifaturacılar Çarşısı Plakçılık Sunar. It's a temporary recording studio for the sounds and voices of the city. It’s housed in a building that has this modern heritage and is famed in popular history as being the site where lots of music emerged from. The building is called İ-M-Ç. İstanbul Manifaturacılar Çarşısı. It means Istanbul Market for Textiles. And the title of the project translates as ‘Textile Market Records Presents’. What is the site and building like? Why here? I did a similar project in Loughborough, in collaboration with Radar and Loughborough University. 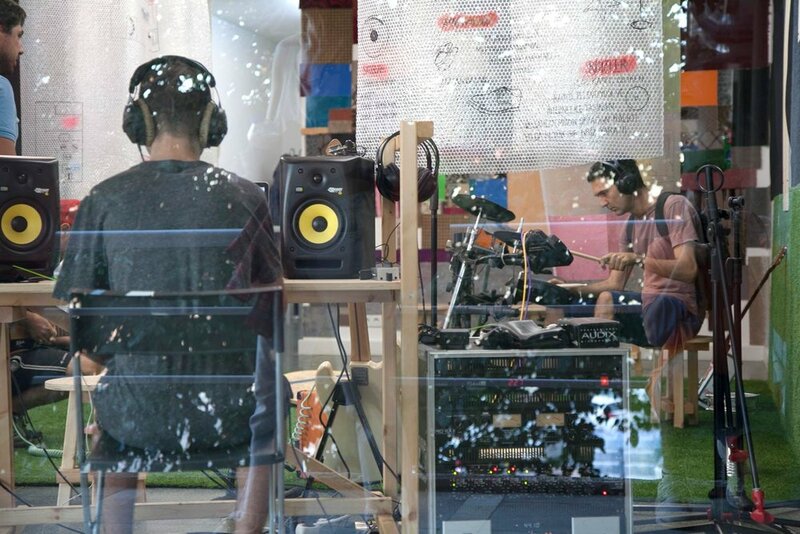 As a recording studio, the motivation was about rethinking the high street as a site of production, and whether the sound collected can become like a portrait of the town. What’s fascinating is that the dialogue that started there with people like curator Nick Slater and geographer Allan Watson are still continuing. But it has a different resonance and meaning when we decided to do it in Istanbul. And this was the place to do it, because the project is taking place in a huge modernist building, which was built in the early '60s for a cooperative of textile dealers. I'm talking hundreds of people. It’s six blocks, over a kilometre long.The building is very much informed from historical and traditional organizations of space, like the ‘arasta’ and the ‘badastan’ where all these dealers allocated in the historic city in Istanbul. So, the architects really looked into the spatial organization, and then translated it into this clean language. It's a very interesting building. What is its history? What’s the connection between music and this place? Well, it was a massive intervention to the city fabric, but I guess it never really blended in. So, the building transformed into various things, and started to have life of its own over the course of 50 years. 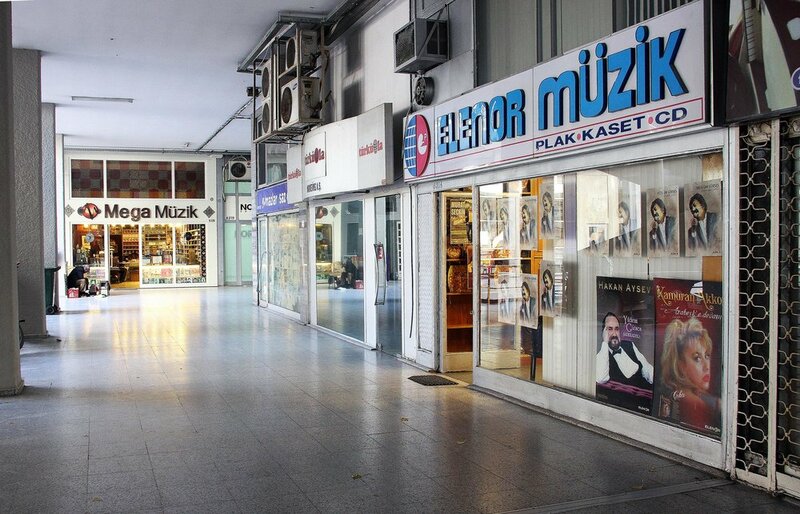 During the late '70s, booming in the '80s and onwards until mid '90s, one of the blocks became the site of the whole music industry of Turkey. And so, there were many record labels and recording studios here. So many movies feature this as the building you arrive from the village to to become famous! It's engraved in the collective consciousness in Turkey. It was huge. Even if you are not from Istanbul, you would know this place because it's the place where this music style called Arabesque was created, and that was a big discussion especially in the '80s, about culture. For many, let's say, ‘high-cultured’ Turkish population, this was almost like the revenge of the masses! It was this melancholic music with almost suicidal lyrics. I’m exaggerating, but it's an amazing cultural phenomena. And this was the site where this whole scene emerged. And in the early '90s, it had a second boost with Turkish pop. And so, if you come across any cassette in Turkey from the ‘80’s you can bet 95% it's been produced in this building. It's a crazy heritage, but almost derelict at the moment. The block where the record labels and the studios were, there are only two or three functioning studios left, and they are not really functioning. I don't want to draw a grim picture, but it's dilapidated in the sense of livelihood. The building is not falling apart, but life has left it. So, in a way, it's also intriguing. It was intriguing to, on the one hand, look into the past and all the baggage of the building and the heritage, and also, simultaneously, try to imagine a future for the building from that. So how does your studio fit? What we are doing is a small intervention. One of the shop units being transformed into a recording studio, but it’s mode of operation is different. It's detached from the music industry aspects in terms of financial issues, because it's free to use and open to anyone who is interested. Of course there's a booking system and you need to reserve and inform us who you are in advance. Is it about publishing or recording music or is it also about having a conversation about what's happened to the building and the future of the building? Good question. We devoted one day of recordings for music and one day of recordings for podcasts (which eventually expanded to two days each). The music is really open — we don't know who will come, but it was all booked up by an interesting spectrum of musicians. With the podcasts we were more proactive in the sense that we teamed up with people such as Kot Sıfır who we thought could bring in that dimension of discussing the place and urban issues through the context of, as you said, the past and the future of the building. How do you try to change the perception of the community looking at the building at the moment? On the one hand, it's a mystical place but on the other hand, very few people go there. Especially our users, who are mostly in their 20s', maybe 30s. They haven't come to this part of town. On one layer it's about bringing people there, channelling and building on our host 5533’s achievements so far. Which I believe in itself is an instigator of discussion around the building. On an architectural level, I give importance to the building because we are also in Turkey at a point where there's a lot of discussion and misconduct around modernist heritage. For better or worse, there are architectural products of a certain era, and the tendency can be to demolish them and build new buildings. That's one thing to tackle. To place İMÇ back on the map in a sense. On a second level, it’s about generating possibilities of use. It doesn't have to be always music or music recording. It can be other professions, other occupations, other activities. To think about using such a building or occupying it more collectively. Proposing new functions or revisiting old functions in a new light and how can it be more open, how can it be more accessible, how can it be more collective? Then can a community emerge out of this? Of course these are polemical questions. I'm more in the practice of making models and propositions. That's important. We're trying to demonstrate the possibility. Is there a reason that the music industry is no longer inhabiting the building? Some of the big players are still in the building, one of them is the digital distributor for international mainstream platforms so they transformed themselves. This is less about the making of music and more about the industry-side of music. Also in terms of content, things either drifted elsewhere and some newer producers, they don't want to settle in that building so they set up their own shop in different parts of town. The high times already declined by the late 90s' super rapidly. Then people didn't come back I guess. I guess this would have a big influence in the neighbourhood if this was a big part of daily life there. How do you try to change the perception of the community looking at the building at the moment? To contextualize, as I said this building is almost a massive spaceship that landed - i.e. the building is a neighborhood in itself. So I wouldn’t want to undermine so many people who work and trade here. We wanted to materialize that presence in the studio as well. For example, our big carpet wall is made up of samples and leftovers from carpet dealers in the block next-door. Its immediate surrounding settlement is also changing rapidly. It was always a place that got an influx of rural immigrants, but now also there's a lot of Syrian immigrants who settled down. The touch points between the building and the neighborhood are limited. Even though the initial building designed dreamed of a flow, there are barriers. My initial concern was more about thinking about the building and its community as the neighborhood. That being said, there could have been further investigations or probes into neighboring communities through sound. We kept it to people who responded to our open calls, but there is definitely more to explore in the ways in which you can make those ‘calls’, and that could have been a beautiful addition to the sounds we collected. Who owns this place at the moment? And how do you then work with them and the community? This single unit we inhabit, is unit 5533 and is owned by an arts collective called 5533. Run by Nancy Atakan and Volkan Aslan. They have history in the cooperative, they have been using it for periodical events, for talks and things like that since 10 years. We transformed that unit for a duration of two and a half months. The funding of the project has also been a collective endeavour. There is no single sponsor, we made calls for support, offered small gifts in return and raised money with around 50 supporters. There are also temporary donations of instruments, which are vital. I should address here that the project was made possible through other collaborations as well: the brilliant Amira Arzık is the producer, Doruk Keskin our sound engineer, and a group of my students (full list below) who called themselves “Saz Arkadaşları” (meaning band-mates) worked on the project. So why did people get behind it? Why is this project important now? This time there was no institutional frame whatsoever, but I think it was really important to do it now. It's obviously music and the place, but it's also important to note that being vocal about your ideas or having a place to express yourself is getting narrower and narrower, around the world as well, but especially here in Turkey. I think this was an important trigger, the hope and horizon, even if it’s from a tiny place. It was also important that we resonated with everybody who wanted to contribute, and this notion of the format also helped it. Everybody had a clear idea about what it is.“It's a recording studio. People will come and record. I want to be part of it”. The supporters were more aware of my work clearly, and the users were motivated by the promise of being present and being heard. Given that this is about expression, what have been some of the most surprising sessions, something that you didn't expect or something that was popular with the crowd? It's still going on so that's hard to say. The first sessions were younger and contemporary and experimental, but as time progressed, we started getting more diverse participants, in terms of the sound, and background of the musicians, and also the instruments they play. Because what you're creating is a platform, you put the conditions in place for other people. If you were to give advice to someone who wanted to create a similar platform elsewhere, what have you learned from this that you could pass on? I think being open is very important. Setting of course, as I call them ‘setting a setting’, setting parameters is important as the beauty of these experiences is always through the community. The settings surround themselves with all the people that get involved with it in some way and you don't necessarily have control over that. Once its finished, what legacy does this project leave behind? That’s the thing I think is thought provoking. It’s a recording of a sound of a place. It's almost like a portrait of a moment in time through the sounds that people make. It's not only live or it's not only performance, it's not only about making the music but it's also about recording and keeping a memory of it. Definitely sharing and distributing those recordings as well. That for me is very important about this project. And where can people hear this portrait? We are releasing the records online. We will do a kind of limited cassette series. That was something we promised to our backers. We continuously release finalised records on Soundcloud, here. MÇPS team members “Saz Arkadaşları” are: Beste Tekdoğan, Birtan Yılmaz, Can Küçük, Cem Örgen, Esra Genç, Gülce Yuyar, Güneş Arısoy, Kıvanç Sert, Nilay Aktuğ, Pelin Şimşek, Selcen Fidan, Selin Karcı, Su Kartal, Ümit Üret, Atakan Gür. In the way that a producer creates the conditions to draw the best from a performer, in Can’s approach, the artist becomes the instigator and facilitator who sets the stage for community expression that can shift perceptions about a place. With this perspective, a newspaper can become a public space or a recording studio can create future memories. Subverting a popular format creates a simple way to engage people, then frees up the content to provoke thought and tackle the complex issues we often find in urban spaces. Familiarity grows out of the site’s narrative itself — the image of a place held in collective consciousness, or the everyday and unplanned activities that people appropriate the space with everyday. Such stages are at their most powerful where people are in search of a platform for expression, exchange or information about a place — a common situation around the world, and especially now in Turkey. They work when the community is open and has a desire for dialogue, to share ideas, or highlight the story that is not being told elsewhere. Building them together by testing the appetite through crowdfunding brings others into the fold from the outset. As places evolve and their communities change, using a platform to debate and discuss future uses can shape new possibilities for a place. Being open to people using these platforms in unforeseen ways creates unexpected ideas about how a space could be reimagined. Equally, creating a legacy or record that lives on once the installation is over captures an essential memory that can spark new prospects.